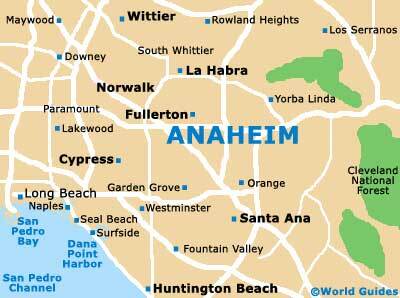 Anaheim is not overwhelmed with cultural attractions as such, although the history of the city can be discovered in the Anaheim Museum. There are several other interesting museums in the surrounding boroughs of the city, ranging from collections of classic cars and lifelike wax sculptures, to the ever-changing displays at the Muzeo and some of the best art works to be found in California. 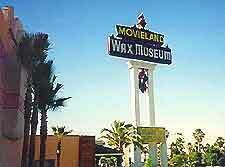 Families holidaying in Anaheim and looking for something away from Disneyland often favour the Movieland Wax Museum, which actually resides within the neighboring city suburb of Buena Park, some 6 miles / 10 km from downtown. Closer to home, the centrally located Muzeo attraction may also be of interest and prides itself on its appealing exhibits and related lectures. 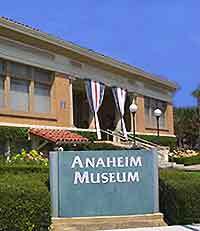 Not far from the Convention Center is the Anaheim Museum, which is housed in the Carnegie Library, the only remaining library out of the original five Carnegie libraries in Orange County. Anaheim's story is told in the Anaheim Room in the North and South galleries, while there is also a children's gallery. Movie stars from more than three generations inhabit the various rooms and exhibits at Anaheim's Movieland Wax Museum, with literally hundreds of stars and politicians immortalized in wax. Famous figures displayed include the likes of John Wayne and Marilyn Monroe, as well as more recent stars such as Keanu Reeves and Julia Roberts. George West Bush is also featured along with the Beverly Hillbillies and the crew of Star Trek. Joe's Automotive Museum / Joe's Garage is an intriguing and altogether different style of museum from your usual educational center. Joe has an interesting and varied collection of racing cars, hot rods, classics and custom made machines accompanied by impressive murals depicting the rise of the automobile in California. Located in the city center and just off West Broadway, the Muzeo stands alongside the City Hall and is just a stroll from the Heritage Forum. Each year, the Muzeo plays host to a number of traveling exhibitions, which in the past have included the likes of the ancient civilization of Rome, the treasures of Napoleon, fictional monsters and beasts, religious art from Imperial Russia, the evolution and biology of frogs, and Mississippi Delta blues legends. Convenient parking is available close by, on the corner of South Lemon Street and the Center Street Promenade.